At CRT, we have developed the following coatings to help avoid replacement and labor costs, and solve problems due to corrosion. By using these products, HVAC units, condensate pans, cooler basins and surrounding metal surfaces remain protected, enhancing sustainability, and reducing unforeseen maintenance expenditures. The lifespan of an HVAC unit is a significant consideration when determining maintenance budgets. Replacement can cost tens to hundreds of thousands of dollars, leaving building owners and managers unprepared if a unit needs to be replaced prematurely. This is money not budgeted, and not available. If early failure can be avoided, or the actual unit lifespan can be prolonged, it would greatly affect the cost per year of ownership. Using coatings can protect and extend the life of HVAC units. Certain coatings are quite effective at stopping corrosion within air handlers, the number one cause of premature HVAC coil and pan replacement. All metal objects eventually corrode, however condensate pans, cooler basins and surrounding metal surfaces are particularly susceptible due to water accumulation and buildup within the HVAC system. 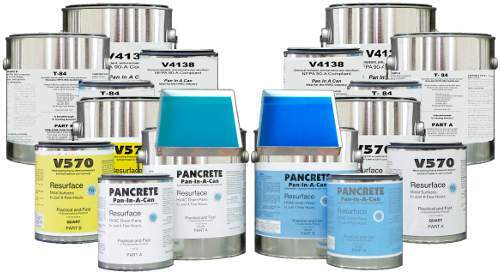 Pancrete, “The Pan in a Can”, is a permanent, self-leveling, two part epoxy-like resurfacer. It can be applied to any horizontal HVAC surface, including condensate pans, cooler basins and surrounding metal surfaces. Difficult and expensive replacement is avoided, and Pancrete’s blue color adds aesthetic value. Also available in a NFPA compliant version called T-84. V-570 is a permanent, paintable resurfacer designed to work in conjunction with Pancrete. V-570 is a two part, epoxy-like coating that can be applied to any vertical HVAC surface. Structure failure due to corrosion is avoided, and V-570 is colored white making future cleanings easier. Also available in a NFPA compliant version called V-4138.